We at LinenMe want to help you care for your linens and provide full care instructions with all our products. But we understand that you may have linen textiles bought elsewhere, or have more questions about table linen products with hand-embroidered detailing. And because we want you to get the best from your linens, here are some handy hints on how to wash linens. – Regular washing is actually good for pure linen, softening and beautifying it, and giving it a lovely ‘lived-in’ look. With relaxed linens like these you don’t need to store them away ‘for best’, you can enjoy them every day. Linen fabric gets resists dirt more easily than other textiles, and if rinsed thoroughly it comes up just as new every time. – White pure linen items without special finishes, such as hemstitched borders, can be laundered at temperatures of up to 95°C. We normally recommend using a 60°C setting, as higher temperatures tend to wear linen out faster. – Before washing always separate dark, coloured linens from white or off-white linens. – You can use stain remover on stains before laundering, but avoid using bleach since it weakens the fibres and may affect the colour of dyed linens. It’s worth noting that bleaching particles in conventional washing powder make natural linen colours fade. – Try to rinse or soak any stains immediately, when still fresh, and use natural stain soaps if needed. Cover red wine stains with sugar or salt instantly to avoid permanent staining. Sugar and salt are well-known for absorbing the moisture. Just wipe the sugar off the tablecloth straight away and it should take the worst of the wine stain with it. – Linen garments, table linens and bedlinens normally do not need pre-washing (or soaking). However, if you are washing a linen item for the first time, it can be soaked briefly in lukewarm water before the wash to avoid creasing. – A conventional machine wash and fast spin is recommended. Use a hot iron while the linens are still slightly damp if you want to press your linens. – Linen has a distinctive crispness which you should be able to achieve with a hot iron – no need to use starch. However, if you really want extra stiffness, table linens can be starched after a wash to achieve that extra crisp finish. 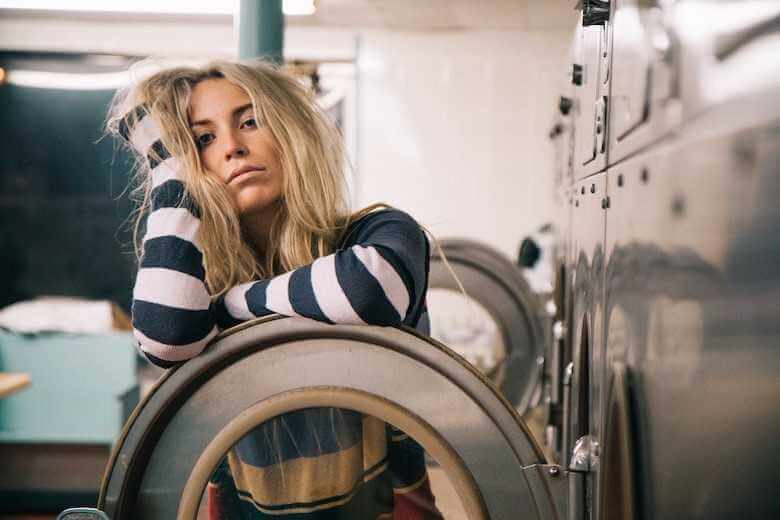 – Wash linen articles separately from other materials, especially during the first wash, as natural fibres tend to lose lint (or ‘nap’), which you don’t want to end up on your other items. – To reduce creasing, load your washing machine half-way. This will also ensure linens get plenty of water while rinsing. – If possible do not tumble dry your linens, as it may leave permanent creasing and it definitely shortens the life of linen. Statistically, the percentage of shrinkage in linen products is approximately 4-5% if dried naturally, but it increases to nearly 10-15% if linens get a good spin in a hot tumble dryer. – Straighten out your linen garment after the wash before hanging it on the washing line. – Fine hand-hemstitched items, such as the above-mentioned Diana tablecloth, require extra care. If washed in a washing machine, a low-temperature and low-spin setting is recommended. Never tumble dry fine hemstitched linens. Dry-cleaning can be a good idea for delicate textiles. And last but not least, always follow the manufacturer’s care instructions on the label attached to the linen item. They are there for a reason! If you have any further enquiries about LinenMe products and how to care for them, please let us know. We are always happy to help. 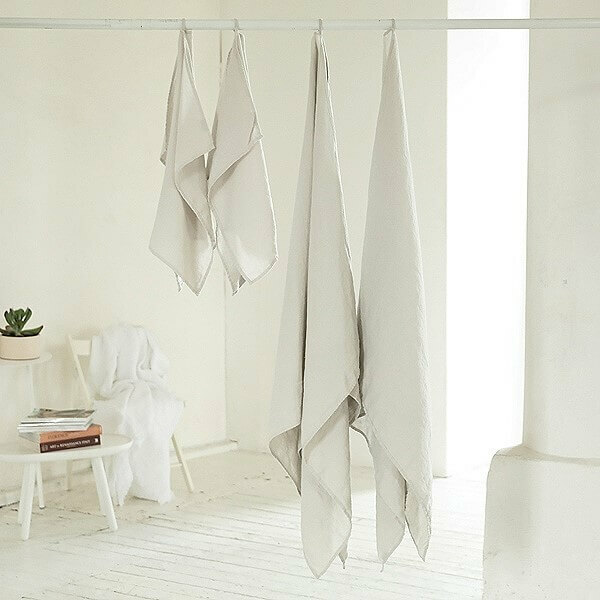 Inga Lukauskiene is a passionate linen lover, designer and owner of LinenMe, which is a small 3rd generation family business working with linen fabric. Inga also runs a blog Linenbeauty.com, where shares her thoughts about simple and slow living. Thank you so much for sharing this with us, it really helped me a lot. I would recommend your site to everyone I know and I am hoping that you would also do the same. Thank you and more power. I am about to make linen cushion covers and my plan is to pre-wash the fabric. How will that change the feel of the linen? Is it just personal preference? I don’t think I want to always take them to the dry cleaners, so am leaning toward pre-washing. Thank you for your thoughts on this. I have very little experience working with linen. It make sense to pre-wash linen fabric before you makecushion covers as it might shrink a bit depending on the weave and quality of it. It should be softer after pre-wash. There is no need to take them to dry cleaners – youcould wash them. My dress has a mixed of 55% linen and 45% viscose. will it shrink after washing? will it make a difference to hand wash it or machine wash? should I use cold water or warm water? Lastly, should I lay flat or hang dry it? If it has 55% of linen it could shrink after washing. The shrinkage would depend if the fabric was prewashed before or not. If you use lowest temperature program it is ok to wash with machine (but if you prefer handwash it is also ok :-)). Water of low temperature would minimize shrinkage. Lay flat – that is better. I washed a dress made of Italian linen for the first time. I expected it to shrink or keep its size. To my surprise, it is now bigger than before. I don’t mind that, but I cannot understand why it happened. Does anyone have an explanation? I have a suspicion that it is not 100% linen fabric. Another option is that it was made from pre-washed fabric and it was hanged still wet – this could make your linen dress by couple of milimetres longer, but not more. My husband purchased a linen sport coat and had it altered. It’s still a bit too big and am wondering if washing it in hot water and drying it in the dryer would shrink it a bit? Thank you for writing. Are you referring to any specific situation which you had? Linen shouldn’t be in any way special from this point of view. I bought a handcrafted linen dress a few weeks ago and accidentally put it in the drying machine. The dress shrunk a whole size and now I have no idea how to reverse the effect for it to return to its natural state. Any advice?? I love this dress and would hate for it to be ruined by this. Sorry to hear about this accident. Unfortunatelly there is no magic way to reverse it. You could wash it and hang still a bit wet (that could bring a bit length back, but not much). Linen fabric shrinks when you wash it for the first time. The % would depend on the weave and manufacture. LinenMe clothes are all made from prewashed fabric, so the shrinkage would be very minimal or none. Nevertheless you have you still have to be very careful with temperatures on both: washing machine and the dryer – always use the lowest possible temperatures. I recently purchased a huge grey linen tablecloth with 16 napkins to match for Thanksgiving dinner. Needless to say, there are lots of grease stains that will not come out in the wash. I feel I cannot use it anymore because it looks awful! Please suggest how to launder and remove stains? Thank you for your note. First I would suggest to get manufacture recommendations for this as it it might differ depending on the composition and quality of fabric. For good quality linen tablecloth we have some recommendations in this article how to get the grease stains out. Hopethis helps. I just washed some linen yardage and did not put it in the dryer. Went to hang it to dry, I find an enormous ammount of lint seems to be stuck to the still damp fabric. any idea whats going on? The lint is usually caused not by how you wash it, but by the quality of yarns used to make linen fabric and the type of the weave. The looser the weave of the fabric the more chances that you will have some lint. Dryer usually helps to “collect” most of the lint (make sure you use low temperatures though), but it doesn’t solve the root cause. If the quality of linen fabric is good then the lint should disappear after cuple of washes. If the quality of linen yarns used to weave the fabric was poor then the lint issue will really continue for a while (it should be less and less with every wwash though). If it is just water mark then washing cushion cover in washing machine at the low temperature should be fine. The only watch out is that it could shrink a bit, so if the cushion inside is very tight already that might be a problem. Please check the shirt washing instructions. If there are no bleaching warnings on the label then I would suggest oxygen-based bleach. Soaking over night would be recommended before washing. Be careful with washing temperatures as you are dealing with linen here, so don’t exceed max recommended temperature that is indicated on the shirt’s care label. I bought a natural linen dress in Italy. There are no washing instructions or label. I got some small salad dressing spots on the front of it. What can I use on the spots that won’t take the color out? I believe you won’t avoid washing your dress in order to take out those spots. It doesn’t sound that they are very tough stains, so I suggest you don’t use any special stain removers. Here is good article with tips on how to wash your linen clothes. I’m afraid I won’t have any good news for you. The shrinkage would depend on a weave of the fabric, but it could be even up to 15%-20% if it was made from not pre-washed fabric (LinenMe linen shirts are made from pre-washed). Washing in cold water I’m afraid won’t reverse the shrinkage effect. You most probably could get a cm back (in length) by hanging still a bit wet shirts after washing on the hanger (but if they shrunk dramatically it probably won’t help much). wrinkled appearance. when monsoon rains started draperies became several inches longer. will draperies return to normal length when rains cease or will we be forced to raise drapery rods. They should return to normal when the wether is dry. Which is less harmful for linen pants, washing it in the machine using the handwash cycle (no tumble drying, just the minimum spin dry) or washing it by hand? If you wash your linen pants for the first time and manufacture didn’t use pre-washed fabric to make those pants then you will have shrinkage effect anyway (if you do machine washing or handwash. If the fabric was pre-washed then you are perfectly fine washing it in the machine as you described. My advice would be to follow instructions of manufacture. If it says “dry clean” then probably there is a reason to give this recommendation. I would recommend to contact manufacture with this question. Upon customer request LinenMe fabrics could be sold as pre-washed and there would be no problem with machine washing items made from our linen fabric. I am attending a summer wedding in 2 weeks. I checked my cream linen suit to see if it needed cleaning as I haven’t worn it for 4 years and there are some faint light brown stains that I thought were maybe beer splashes from the last time I wore it. As the label suggests dry cleaning that’s where I took it. He said he doesn’t think the stains will come out as they are damp spots but he will try anyway. If unsuccessful, could I dye it a light brown or blue to cover up the stains? For linen suit I would suggest to stick to dry cleaning (especially as label suggests that as well). Obviously 4 years is not helping factor here, but I would definitely give it a try. To be honest I don’t think you’ll be able to dye it at home conditions – it’s not an easy job even with professional equipment. As a last resort I woud rather use stain remover combined with delicate rinsing of area around the stain. Re drycleaning linen: I had an expensive linen jacket dry cleaned and it had colour stripped and altered. IMO and experience linen thrives on washing, preferably hung to dry. Linen is stronger when wet, used for sails and Alexander the Greats army had 20,000 suits of armour made from many layer soft linen. Remember flax was cut and then left to dry on grass for weeks and in dew and rain or rotted in pool to separate the part of the stalk used for spinning into thread for fabric. I am in Australia and struggling to find a good laundry liquid to use for my linen sheets. Most have optical brighteners or such which lie over the linen and make it dull and grey. I have “rediscovered” a black linen summer sun- dress that I’ve had for at least 15 years but have not worn for at least 10! It fits perfectly (yeah) and I had fun wearing it recently. In the past, I always dry- cleaned per garnet tag instructions. My question….after dry cleaning during its previous life, will it be ok to machine wash (delicate cycle and Woolite) or does it need to go back to dry cleaners? Thanks for recommendation! If your dress hasn’t been washed there is achance that it can shrink a bit after the first machine wash (it may not if manufacturesold it prewashed as we sell all our LinenMe clothes prewashed) Yes you decide to take a risk please use lowest possible temperatures when washing. 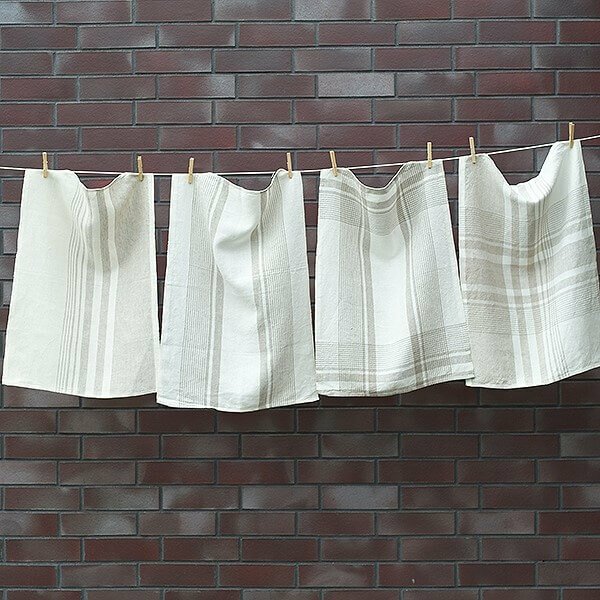 I bought some herringbone 100% linen towels online from etsy made in Lithuania. I washed and dried as instructed, there is lint everywhere. Is this temporary or will it continue? I haven’t seen this happen with a no-print thick linen kitchen towel. Thanks! It’s really difficult to comment not seeing the fabric itself, but usually there is more lint with loose weave fabric. If fabric is of good quality you’ll get less lint with every wash (but don’t expect it to dissapear completely after the first or second wash). Choose tight weave linen fabric to avoid issue with lint (try e.g. these LinenMe towels). I have some white linen pants that I always been dry cleaned. They are starting to yellow some. Is it ok to now try hand-washing them or once they’ve been dry cleaned, I should stick with dry cleaning them? There is a small risk of shrinkage once you wash them for the first time (maybe not if manufacture sold it prewashed). If that is not a problem then please go ahead, but use low temperatures. According to my very thorough and meticulous dry cleaner, white garments (silk, linen, cotton) need to be dry cleaned in very clean dry cleaning solution, a solution that is changed regularly and never used to clean any other color of garment. If you ask your dry cleaner and they have not cared for your garment in this way, you should be able to find another cleaner that will, and the yellowing should be able to be removed with cleaning. I have learned so much already from reading your answers! Can you advise re the white areas that keep appearing on some of my recently purchased navy blue linen garments? I love wearing linen, and have had black and dark green linen trousers, and tunics, down the years. Never any white powdery-looking patches on any of those. Is my decision last year to change to navy blue causing the problem? Perhaps the type of dye is to blame? I have followed the laundry advice on each garment’s label, and each time the whiteness disappears in the washing and ironing process. Then, a week or two later, the powdery white areas recur, not in any particular area, but in several parts of each garment. This happens whether I put them through a gentle machine wash, or a hand wash. It shouldn’t be a problem with navy blue or the way you wash it (if you follow instructions and tried both gentle machine wash and hand wash). I would suggest to use different detergent first – try liquid if you use powder one now. If that doesn’t work then I suspect the issue might be with the fabric itself (the way it was treated before dying). You should contact manufacture of those garments explaining the problem. I could only guarantee that LinenMe clothes will not have such issues. I washed a loose knit linen sweater and put it on a rack to dry. It is totally stiff, no drape or softness to it at all. What can I do to bring it back to it’s original condition? THANKS! I would really suggest to contact manufacture to get an advise. I have had good luck from using a product called Milsoft. I initially used it after dying linen fabric, and the drape even after ironing was not what I was hoping for. Our local dye shop (Dharma Trading Co in San Rafael, CA) recommends it for drape issues after drying, and I have now used it with my cotton sweaters that were stiff after handwashing. Use tightly-woven linen fabrics – they doesn’t pill at all. The problem could be with loosely-woven linen fabrics. There is no way to prevent it completely, but we advise to wash fabric with detergent with enzymes – it will reduce pilling. Be careful with bleach as it can damage the fabric. Prease read care instructions of your dress carefully. If it says nothing about bleaching then I would contact manufacture for an advise as silk is very delicate fabric (we are linen specialists). If care instructions say that bleaching is not allowed then I’m afraid not much could be done here. I recently bought yards of linen to make no sew curtains . Is it safe to wash in cold on gentle before I make them into the curtains ? Or will the unstitched edges unravel ? If your fabric has selvages (all our sold LinenMe linen fabrics do have) then you could wash without risk. If your fabric doesn’t have selvages then simply cut edges will unravel a bit. My linen shirt becomes longer after hand washing with cold water and hanging. Can I shrink it by washing it in hot water? If so should I hand wash in hot water or put it in machine hot cycle? Thanks. Yes your shirt will get longer if you wash in cold water and hang it. You can shrink it by by washing in machine hot cycle, but my recommendation would be not to put more than 60C to avoid too much shrinkage. I was given a beautiful bedroom set made by a friend who no longer wanted it. She has a dog and after she stored the set in a plastic crate in the attic for six months everything smells like a dog. Is there any way to get the smell out of it? There are no cleaning instructions and she doesn’t remember. I suggest you simply wash it in low temperature setting and add fabric softener. I have some linen sheets but the colour is too deep. Is there any way to lighten the colour or make the sheets paler? If the dyestuff are fixed well during during the process, then the colour wont fade and won’t get lighter. If not then it will fade a bit with every wash. You can speed up this using high temperatures, but there is a risk that it will shrink a bit more. What kind(s) of bleach is/are safe to use on white linen tablecloth to aid in stain removal? First tip would be carefully study washing instructions on the product as different qualities of fabric might have different recommendations. I could give guidance on 100% European quality linen (e.g. LinenMe products). Usually good detergent (Ariel, Tide) would do the job, but on the white colour linen (as I mentioned high quality one and after reading cleaning instructions) it is ok also to use regular bleach product (Ace, Clorox). It goes without saying that you shouldn’t use bleach on coloured linen fabrics for stain removal purposes. It’s very difficult to judge about fabric having the only reference “Made in Yugoslavia”, but if it’s 100% linen you will minimize your risks by Washing it separately and in lowest possible temperatures. You should check with your retailer if their clothes are made from pre-washed fabric. All linen clothes sold on LinenMe.com are prewashed, so they will not shrink anymore. Yes you could use fabric softener washing linen. It is very likely that the colour was not fixed properly by manufacturer and that is the reason for fading. It is also very like that you already got the most of fading effect after the first wash and it shouldn’t fade further with the next washes. You could wash good quality linen fabric with powder soap and it shouldn’t fade more than 5%, which is normal. The best would be to check with manufacture if their curtains are pre-washed. If it was not then it will shrink despite cold water wash and low heat tumble dry. all LinenMe custom made curtains are pre-washed at 40 degrees to avoid shrinkage afterwards. I saw your reply on a comment earlier. You said linen shrinks around 5 to 10%. Does this happen only the first time I put it into a dryer? How about if I put it into a dryer multiple times ? It shrinks the most after the first wash. Always use only low temperature / delicate setting on your dryer for linen. If label says, that it’s only dry cleaning, then I have to say there is no other way to wash it. The only suggestion I can give you – try another dry cleaning company. I have 10 yards of linen fabric I bought from a street market in Amsterdam. It smells musty. I was going to wash on the gentle cycle with some borax, which I hear gets rid of mold and mildew spores. Is this advisable? Since the fabric is so long, I’m wondering how to dry it if tumble dry is not recommended. Lay it out in the back yard? I will use the heavy linen for men’s clothes. Most of linen can be washed in the machine with all standard washing powder. It should help you to get rid of smell. I usually put some fabric softener as well to make fabric softer. You are right about drying fabric by laying it out. Is it possible to get rust out of antique linen? I just bought a pair of [email protected] linen shorts that are a little baggy on me and I want them to shrink. If I run them thru the dryer for 20 minutes will that make them shrink? Try to put them in a washing machine and them a dryer on low temperature setting. Your linen shorts should shrink a bit. If the shrinkage is not enough you could gradually try to increase temperature on the dryer. Be careful though as it can shrink too much on the max heat (if linen fabric is not high quality). I have a beautiful linen tablecloth hand made by my German mother-in-law. We think it is about 100 yrs.old. It is of the Last Supper.Her initials are on it also. It has stains but it dosen’t smell. Can I wash this? Thank you for your question. It is really difficult to give you suggestions without seeing this tablecloth. It should be possible to wash tablecloth if it is 100% linen. If you decide to wash it, please try to wash by hand very carefully for the first time. I usually put some bleacher on my white table linens, which takes out stains and makes them whiter. But I do not think it is good idea on old linens. I’ve just been given a cedar chest full of old linens. They smell of mildew but have no stains. Is there any way to remove the smell and is it harmful to our health to have it in our house. I want my linen sweater to shrink. Can I throw it in the washing machine and dry it even tho the tag says dry clean only? Your linen sweater can shrink if you put in the dryer. Please keep in mind, that good quality linen (european) shrinks 5%. If your sweater is produced somewhere in Asia, it might shrink till 10%. Is it best to use conditioner when washing linen? Yes, it is recommended to use fabric softener when washing linen, especially if it is bed linen or linen towels as softness feel of those products could be the deciding factor if you like them or not.